For when a posting contains videos for the sale. The President’s Day Sale is open online, with individuals and groups of open and bred heifers and cows. There are also embryo packages available, and 2 young bulls. Each lot has pictures associated with them if available, but take a quick browse of the picture gallery below to spark your interest! There are also some videos available on the JMS YouTube PRESIDENT’S DAY SALE playlist! Take a look through deep families, genomic interest, high type and good production to find what best suits you and your herd. Then bid online up until 5:00 p.m. (EST) on Tuesday, February 19! 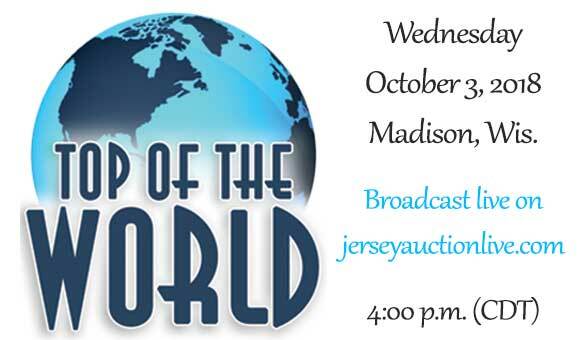 The Top of the World Jersey Sale will be held in Madison, Wis., on Wednesday, October 3 at 4:00 p.m. (CDT) as part of World Dairy Expo. The heifers have been pictured, with the exception of Lot 22, who will be showing Tuesday evening. LOT A – First Choice Female sired by River Valley Spice Showdown and out of Steeshanie Iatola Tinkerbell, E-91%. The Wisconsin State Sale is available for bidding online – http://www.jerseybid.com – from now until Tuesday, May 15. The sale boasts of genomic stars, individuals of all ages with production and type in their pedigrees, and groups of heifers and cows. 1 Bull is also available! Register or sign in to JerseyBid.com to place your bids on these 43 Lots from Wisconsin. All lots have their most up-to-date pedigrees as part of their lot listing, as well as pictures and videos with each listing. Below is a library of the visuals, all in one space!